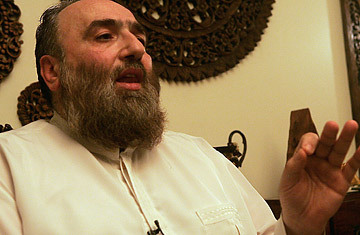 Radical Islamic preacher Omar Bakri speaks at his house in the northern Lebanese city of Tripoli in November 2010. What's Behind the Latest Lebanon Clash? A day after the radical Salafist Sunni preacher Sheik Omar Bakri was arrested last month, having been sentenced in absentia by a Lebanese court to life imprisonment on terrorism charges, he received an unexpected visitor in his holding cell at Beirut's police headquarters. Nawar Sahili, a lawyer by training and an MP from Lebanon's militant Shi'ite Hizballah movement  the Salafists' most powerful local enemy  offered Bakri his legal services. See photographs from inside Hizballah. "I have been delegated by [Hizballah leader Sheik Hassan] Nasrallah to represent you. He has heard your voice," Bakri recalls Sahili telling him. Hizballah's decision to help Bakri may seem odd, given that the Salafist cleric has in the past criticized the Shi'ite organization. In 2007, he told a Lebanese newspaper that he rejected Hizballah's "armed cantons" in Lebanon and questioned why the "resistance" against Israel should be monopolized by the Shi'ite sect. Nevertheless, with a bleak future ahead of him, Bakri accepted Hizballah's offer; he has since been released on bail, pending a retrial scheduled for March. "Now I'm working to bring Sunnis and Shi'ites together on certain issues, such as confronting Israel," Bakri says in his home in religiously conservative Tripoli, Lebanon's second largest city. With Sunni-Shi'ite tensions on the rise in Lebanon, Hizballah has been seeking allies within the small but potentially dangerous Salafist community  a sect that generally does not even recognize the Shi'ite branch of Islam. Salafists practice an austere version of Sunni Islam that emulates the 7th century ideals of the Prophet Muhammad and his followers. While a majority of Salafist scholars reject terrorism, many al-Qaeda leaders claim to be inspired by the sect. Hizballah is increasingly on edge as Lebanon awaits the findings of an international tribunal concerning the 2005 assassination of Rafiq Hariri, the former Prime Minister, who was a Sunni. Speculation is rampant that members of Hizballah will be indicted. The Shi'ite movement has vigorously denied any involvement in Hariri's murder and is pressuring the Lebanese government  headed by Prime Minister Saad Hariri, son of the slain man  to end all cooperation with the tribunal, which it accuses of promoting an American and Israeli agenda to weaken the Iran-backed party. Many Lebanese fear that an indictment of Hizballah personnel could lead to sectarian clashes between rival Sunni and Shi'ite factions. "Accusing a Shi'ite group of killing a Sunni leader leads to a catastrophe," Ali Khreiss, a Shi'ite MP and ally of Hizballah, said Tuesday, Dec. 21. Hizballah is the most powerful military organization in Lebanon  even stronger than the Lebanese army  and will surely crush any armed rivals on Lebanon's streets. But while it has always championed unity between the rival sects, Hizballah is wary of the threat posed by radical Sunni militants who deem Shi'ites to be apostates. Their unease is not without foundation. In Iran last week, 39 people were killed and dozens wounded when a suicide bomber from Jundallah, a militant Sunni organization, blew himself up in the middle of a crowd commemorating the Shi'ite Ashura mourning ceremony. Hizballah held its own Ashura commemoration in its southern Beirut stronghold the following day amid tight security, with streets closed off and snipers watching the crowds from rooftops. Each day before dawn, Hizballah security personnel patrol the streets of southern Beirut, accompanied by explosives-sniffing dogs to check for bombs. "They can set off a bomb here, but they can only do it once," says a Hizballah military commander in southern Beirut, speaking on condition of anonymity as he was not authorized to talk to the media. "After the first bomb, we will seal this place off completely." Last week, two Sunni leaders held a joint conference in Tripoli to deliver unusually strong criticism of Hizballah and Lebanese military intelligence. "The military is encouraging Lebanon's Sunnis to accept the protection of Hizballah, for if they do, they will be found innocent and released on bail," said Mohammed Kabbara, a Tripoli MP loyal to Saad Hariri. Sheik Dai al-Islam Shahhal, the most prominent Salafist leader in Lebanon and the other speaker at the conference, said the accusations were justified. "Hizballah is threatening to change the face of the country, and this is a bullying act and arrogant," he told TIME in his office in Tripoli, receiving nods of agreement from some of his followers seated around the room. "Hizballah sees the Sunnis as an obstacle to executing its program, which is to take over politically in Lebanon and to work with Iran." In September, an hour-long anti-Shi'ite propaganda film began circulating in Sunni-populated areas of Lebanon. The slickly produced film, called The Oppressed Sect in reference to Sunnis, carries the logo of the Abdullah al-Azzam Brigades, an al-Qaeda offshoot that has claimed a number of attacks in the region, including a suicide bomb attack against a Japanese oil tanker in the Persian Gulf in July. Watching the film on a laptop computer, the Hizballah commander shakes his head and tuts as he listens to an Egyptian cleric declare that Shi'ites are the paramount enemy of Sunnis, even before Jews. "This is a desperate attempt to rally the Sunni street," he says. "This is the language of civil war, but no one wants that anymore." At the beginning of December, a statement purporting to be from the Abdullah al-Azzam Brigades accused the Shi'ite organization of stockpiling weapons to "slaughter Sunnis." Shahhal and other Sunni leaders complain that they lack sufficient political and financial backing to stand up to Hizballah. Such feelings of vulnerability, resentment and humiliation could end up fulfilling Hizballah's concerns of Lebanese Shi'ites receiving Iraq-style bomb attacks, Shahhal warned. "If Sunnis don't get outside support to keep a balance [with Hizballah], then we have no choice but to do what we have to do, and this is one of the possibilities of what might happen."